I’ve only found myself in Frederick, MD a few times in my life (I can literally count the amount of times on one hand), but it’s a great little city, with a fabulous Downtown/Main Street area that is quaint and stylish at the same time. I haven’t had a lot of time to fully enjoy the shops and restaurants, but if you are looking for a short day trip from Baltimore or DC, it’s a good choice, with plenty to keep you entertained (including a short drive to Linganore Winecellars). On a recent work related visit, I decided to check out their “cupcake scene.” After doing some Google research, I was shocked to see that there were actually several options. 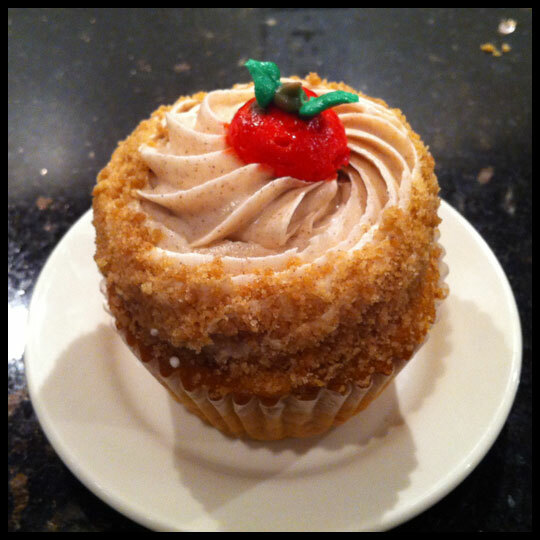 I selected two shops that appeared to be fairly close together: Sweet Angela’s Cupcakery and AngelCakes. 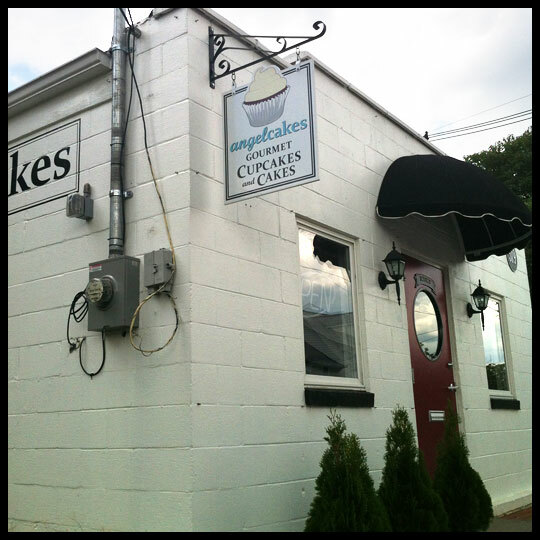 The cinder-block exterior of AngeCakeswas a little less than welcoming (and very different than the norm in Frederick), but they did their best by painting it a bright white and adding nice touches like the awning, sign, and light fixtures. After seeing this, I wasn’t sure what to expect on the inside but was pleasantly surprised by the trendy, modern appearance and cool blue and gray tones. I was immediate greeted and quickly placed my order (Key Lime and Salted Caramel) as the selection wasn’t overwhelmingly large. 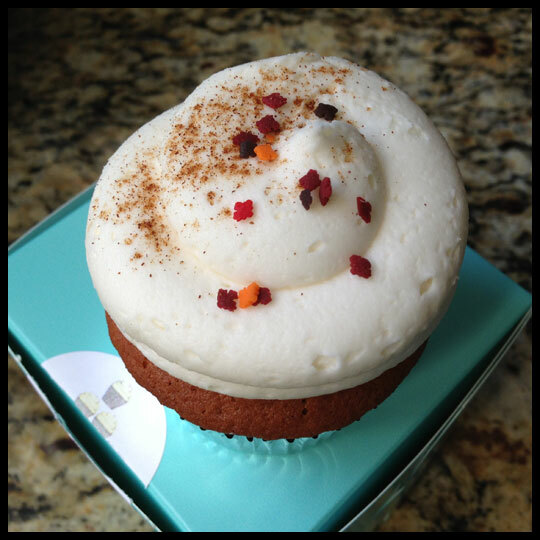 Crossing the street to place the cupcakes in my car, I was stunned to see my next cupcake stop visible just about a block away. I knew they were close, but not that close! Happy that I wouldn’t have to walk far, I practically skipped down the sidewalk to my next destination. 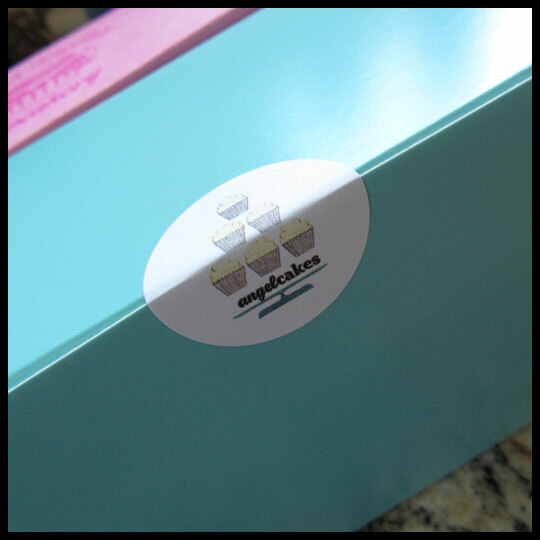 If you think that AngelCakes signage is enough to catch your eye, there is no way you can miss Sweet Angela’s Cupcakery. 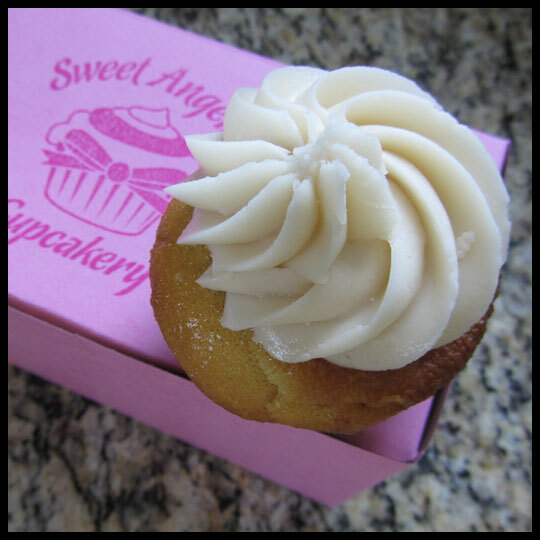 In appearance, Sweet Angela’s is the exact opposite of AngelCakes. While AngelCakes is blue and trendy, Sweet Angela’s is very pink and cutesy, complete with cupcake illustrations on the walls. Despite the differences in decor, their flavor selection was actually quite similar. So similar in fact, that I ended up getting a Key Lime at Sweet Angela’s and thought a Key Lime Challenge would be in order. They didn’t have Salted Caramel though, so I stuck with a classic: Vanilla. As soon as I got home the Key Lime Challenge was on. Visually, each had aspects I liked: Sweet Angela’s had a nice light colored cake, while AngelCakes’ was dark and looked to be a bit over-baked. 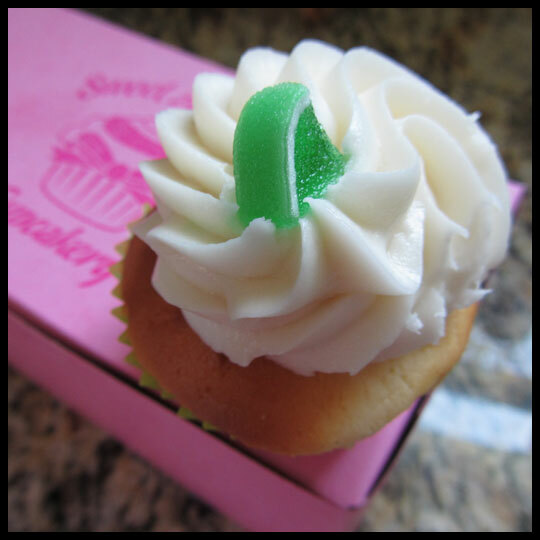 Then, AngelCakes’ Key Lime cupcake had fresh lime zest on top, but Sweet Angela’s just had a gummy candy I knew I wouldn’t eat. But the true test would be the first bite. 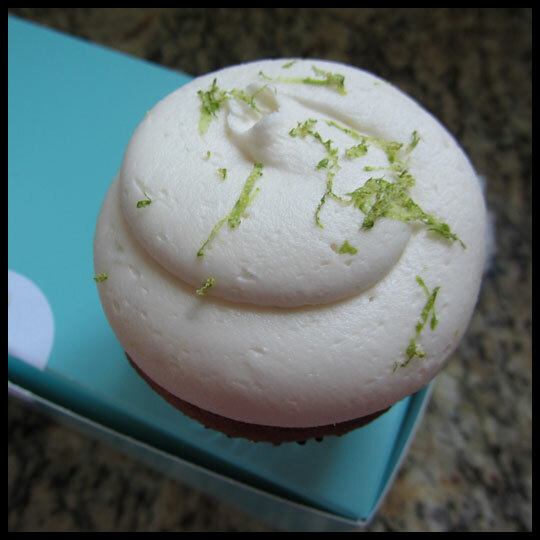 The description stated that this cupcake was a fresh key lime cake with fresh squeezed lime juice, topped with buttercream frosting with a hint of lime and garnished with lime zest, but my cupcake was obviously not garnished with lime zest. I could feel how soft and moist the cake was when pulling back the cupcake liner. It was also dense and a little sticky too, almost like a combination between pound cake and angel food cake. There was only a slight tartness with the cake, but the frosting was very tart; however, it was more of a generic tartness (not specifically key lime) and was artificial tasting. 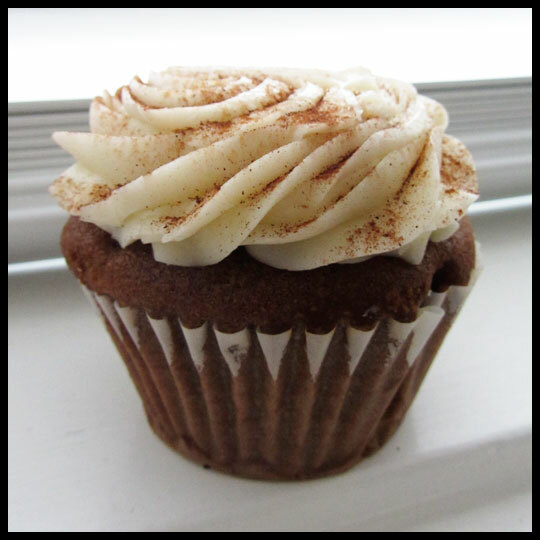 At first I thought this cupcake might be dry after seeing that the top of the cake was a dark brown, but it wasn’t too bad. It wasn’t as moist as Sweet Angela’s but it definitely was not overly dry either. Although you can see the fresh lime zest in the cake (unlike Sweet Angela’s), you couldn’t taste it, which was a bit disappointing. 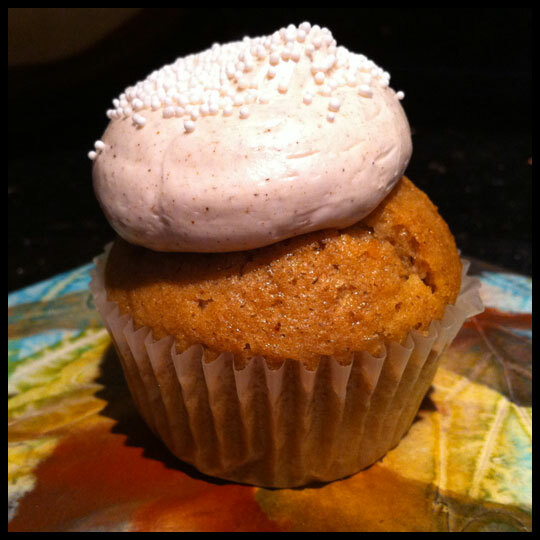 Even the frosting, while light and fluffy, only had just a hint of lime. 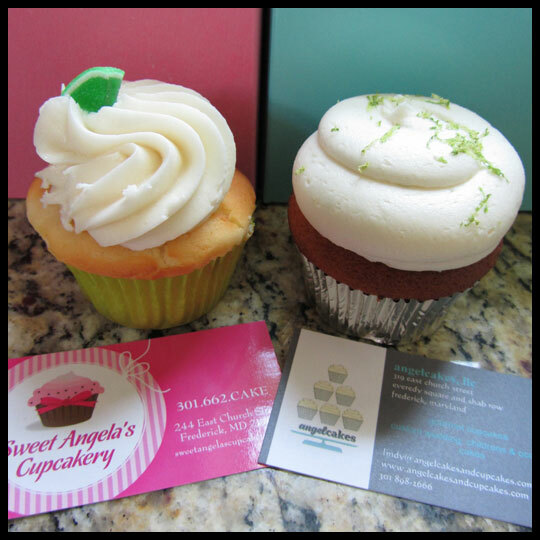 Overall the key lime flavor just wasn’t present enough in either cupcake, but AngelCakes tasted a bit more authentic and more like a homemade cupcake, so wins my vote in the Key Lime Challenge. 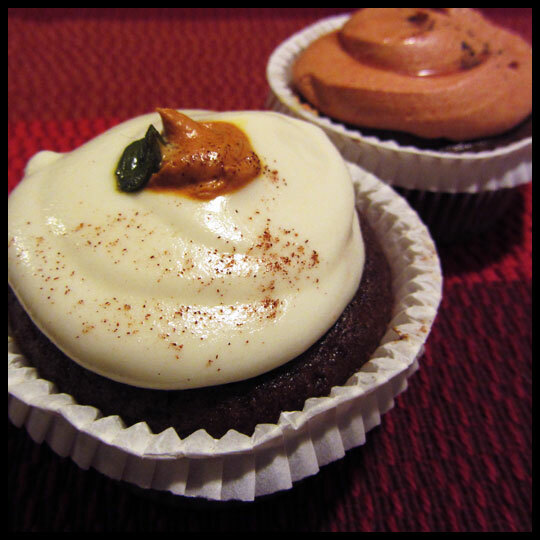 After the Key Lime challenge it was on to the other cupcakes. I’ve come to really enjoy vanilla cupcakes, but this was a letdown for me because the vanilla flavor was really not present at all. The cake lacked flavor of any kind and the frosting tasted like a straight buttercream with maybe a touch of inexpensive vanilla extract. 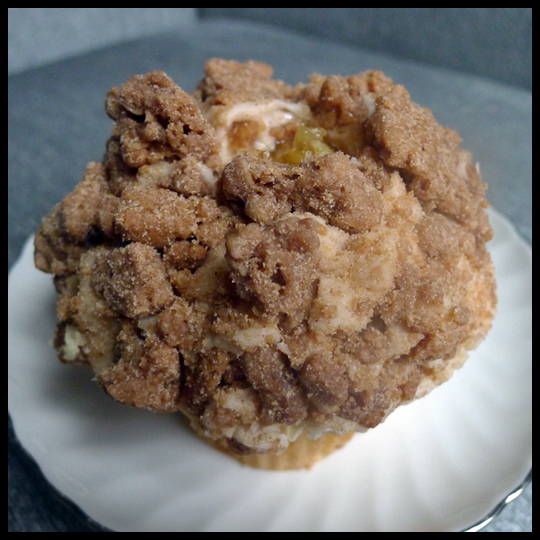 My initial reaction was, “This is a good cupcake!” I only planned on eating half (and saving the other half for later), but after my first bite I knew that wouldn’t happen. 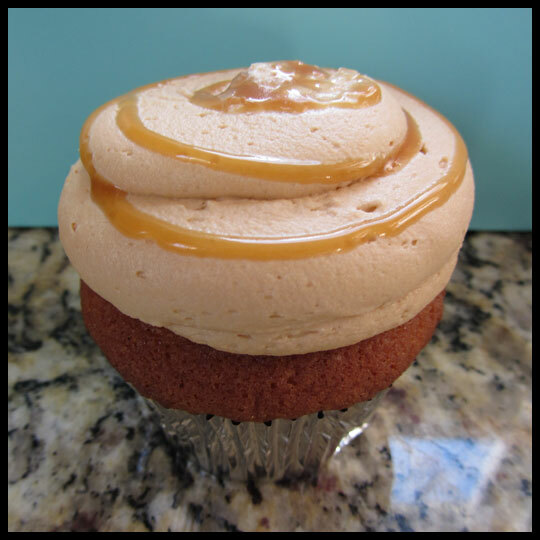 The cake was more moist than their Key Lime cupcake (even the next day) and it had a really nice caramel flavor. 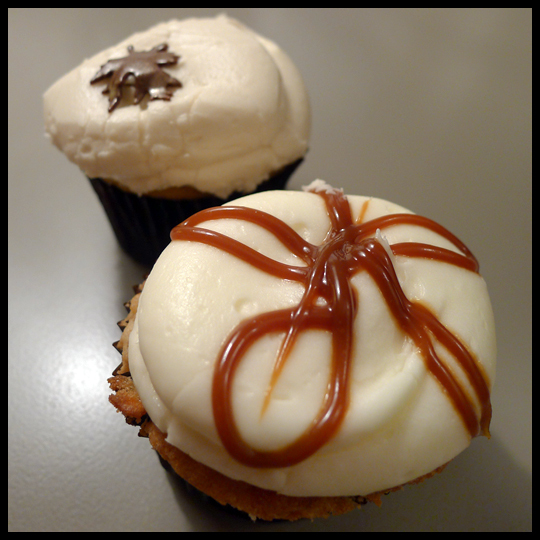 The frosting also had a great caramel flavor and the saltiness was well represented. 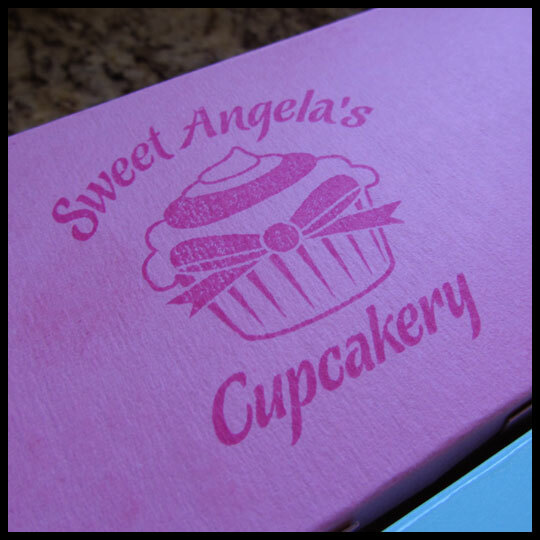 Even though Sweet Angela’s cupcakes were a bit cheaper than AngelCakes’ ($2.50 versus $2.75), I don’t think I would go back there, especially with AngelCakes just a block away. 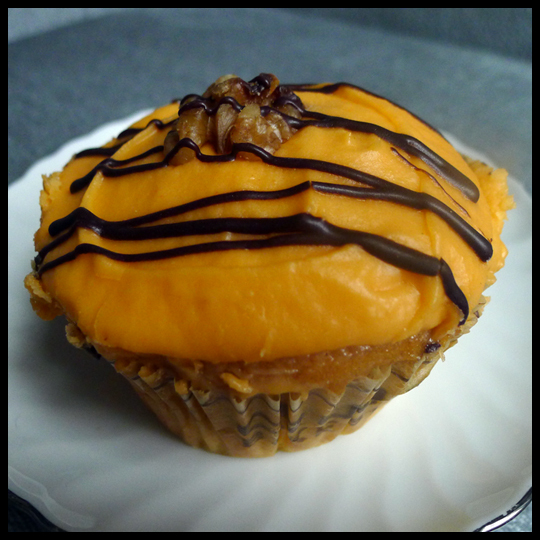 AngelCakes doesn’t make my favorites lists, but there was something nice about their homemade quality. 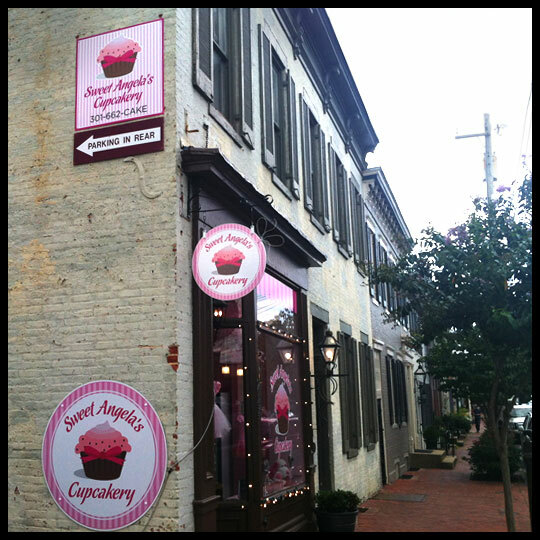 If you are ever in the Downtown Frederick area, maybe you could visit both shops and have a little “Battle of the Cupcakeries” too?